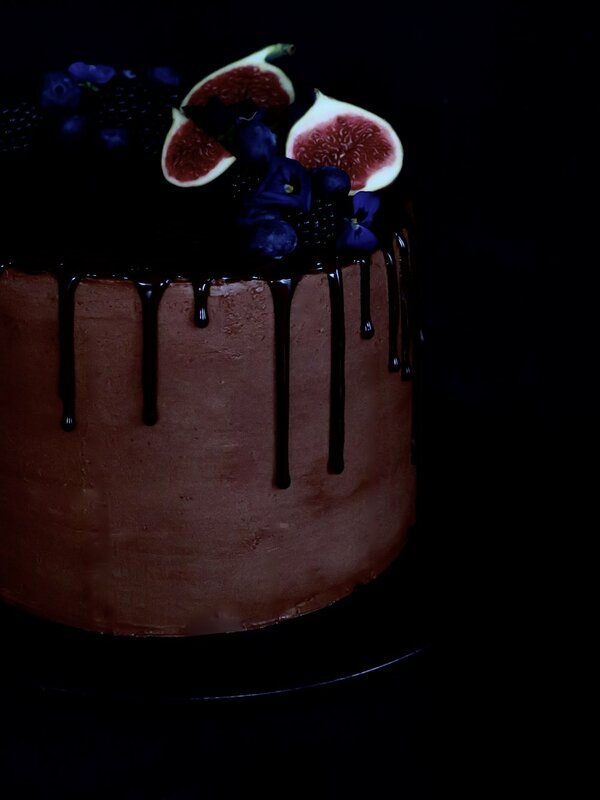 According to most newspapers, January should be the month of indulgence deprivation. With the weather cold, grey and bleak, we’re being told that now is the time to eliminate everything that affords even a hint of pleasure. I admit that it may be time for me to cut down on the panettone habit: I caught myself tearing off fleecy chunks of the ambrosial, yellow, sultana-studded fluff and crowding my mouth until it overflowed. My brother actually created a time-saving method which anticipated the bolus of food that would develop in the gullet by compressing the panettone in his hands first before devouring. I was impressed. Fortunately, but lamentably, my mother prevented me from importing from Italy to England the 5 kg of panettone that I’d bought (with the pretence of giving as gifts). To cope with the withdrawal symptoms, I made these instead. I refuse to deprive myself of pleasure - these can be a happy halfway house. So numerous that they can be popped into the mouth in one without anyone noticing that the supply has been reduced, so light that they can be enjoyed without having to loosen waistbands to accommodate them, and so small that they make gorgeous bejewelled petit fours at dinner parties without the guilt attached, in my case, to eating an entire pavlova. The dark chocolate base adds a touch of sophistication and slight bitterness to undercut the sweetness, and the raspberry provides that much needed astringency to cut through it. Crunch, creaminess, chocolate and tang, all in one mouthful – who needs 5kg of panettone? A piping bag fitted with a round 1cm nozzle to be used twice: first to pipe the meringue, and then the cream. It can be marginally larger or smaller than 1cm. If you lack a piping bag, you can use a freezer bag and cut off a corner to replicate a 1 cm sized nozzle. Preheat oven to 130°C. Pour egg whites into an electric mixer fitted with a whisk and whisk on high speed until soft peaks form. It should be foamy in appearance. Switch the speed to medium-high and pour in caster sugar one tablespoon at a time. Once each tablespoon has dissolved into the mass of egg white, add the next. Keep whisking until the meringue forms hard peaks and is glossy i.e. the meringue should hold its shape when drawn into peaks with a spoon and the tracks of the whisk are visible in its surface. Spoon the meringue mixture into the piping bag. Holding the nozzle at a right angle to the baking parchment, pipe 3cm diameter sized meringue peaks onto the parchment in rows, leaving 3cm between each one (they expand slightly as they bake). Place in the oven and cook for 45 minutes, checking after 30 minutes. Once cooked, switch the oven off and allow to sit for another 15 minutes in the oven. They should remain pale and be crisp on the outside and slightly soft in the centre. Remove cooled meringues from the oven, and set them aside. Break the chocolate into pieces and place in a bowl over a pot of simmering water. Don't allow the water to touch the base of the chocolate bowl. Don't melt the chocolate directly in a pan on the stove as this causes it to seize. Allow to melt, stirring occasionally until glossy and smooth. Remove from the heat. Lightly holding the meringues at the sides with thumb and forefinger, dip the base of each meringue into the molten chocolate so that it coats the base and up to 1cm on the sides of the meringue. Place the dipped meringues back on to the baking parchment. Once the whole batch is coated, place the tray in the freezer for 10 minutes to allow them to set. In an electric mixer fitted with a whisk (or by hand if you’re feeling strong), whisk the cream until thickened. The tracks of the whisk should be visible and it should hold light peaks. Spoon the cream into a piping bag and pipe about a teaspoon of cream on to each meringue. Place a raspberry on each cream peak, face down. Sieve icing sugar over, if desired, and serve. Best eaten on the day but the meringues without topping can be kept in an airtight container for a couple of weeks in a cool dry cupboard, and for a month in the freezer. My household has recently been beset by a typical problem. My mom rather enjoys pressing the "+”button when ordering from Ocado. Whereas last week this resulted in a glut of cherries, this week it was passion fruit. Even after days of bisecting the plum-coloured orbs and slurping up the tangy yellow spawn (sans spoon, and only in the most ladylike way, obviously), the supply remained steady. Clearly, truffles were the solution. Most truffle recipes create a molten ganache centre by simply combining melted chocolate with the flavour/ingredient of choice and a dribble of cream. Easy? Perhaps. Zero depth of flavour? Indeed. I make a caramel base to add a darker, nuttier complexity. This is poured over the dark chocolate to melt it, and the golden toasted coconut is then swirled in with the fresh and tangy passion fruit juice. I recommend using good quality dark chocolate – the results are worth it. The tangy molten ganache is then frozen, later to be formed into spheres. These are encased in a crisp white chocolate and coconut shell to add a touch of sweetness and contrast of textures. The name “passion fruit” does not, as you might assume, come from any aphrodisiac qualities of the fruit. Rather, it comes from the shape of flower which resembles a crown like that that of thorns around Jesus’ head – thus, passion derives from the "passion of Christ”. Indeed, these truffles are rather ambrosial – you could even say that eating them is a religious experience. 8 passion fruits, sieved to extract about 90ml of juice. Chop the dark chocolate roughly, and set it aside in a large heatproof mixing bowl. To toast the coconut (70g), place a medium frying pan over a medium-high heat, pour the coconut in and stir continuously for 5 -8 minutes until the coconut turns a light golden colour. Add this to the dark chocolate. Place the caster sugar in saucepan over medium high heat, and when it starts to melt, stir gently with a spatula to avoid the sugar burning around the edges. Push unmelted sugar into the already caramelised sugar to aid the caramelising process. Once the sugar has turned a rich, dark gold colour, while still on the heat, pour in the cream, whisking all the time. If clumps form, don’t panic: keep whisking over medium low heat, and they will eventually melt. Once the lumps have dissolved, whisk in the muscovado sugar, butter, vanilla and salt and stir the bubbling mixture on a medium heat for another 2 minutes. Pour the hot mixture into the bowl of chopped dark chocolate and coconut and stir immediately until all the chocolate has melted and the caramel and chocolate are fully combined. Pour the passion fruit juice into the mixture, and stir to combine fully. Pour this into a shallow tray, and place in the freezer for an hour to set slightly. Once it has become slightly more solid, remove the tray of mixture from the freezer. Use a teaspoon to scoop out dollops, and roll each between the palms of your hands to form 2cm diameter spheres. Roll the spheres in the icing sugar to coat them finely, and then place them on a baking tray with space around each sphere to avoid their sticking together. Once all the mixture has been rolled into spheres, place the baking tray in the freezer for half an hour or until the spheres are firm and cold to touch. You may need to do this in batches as the ganache mixture melts very quickly. Break half the white chocolate (250g) into pieces and place in a bone-dry, heatproof bowl (any drop of water will make the chocolate seize). Place the bowl over a pot of boiling water (without the boiling water touching the base of the heatproof bowl), and stir occasionally until the chocolate is melted. Remove the dark chocolate spheres from the freezer, and one at a time, skewer with a toothpick and coat by spooning the melted white chocolate over each frozen chocolate sphere. Remove the skewer, replace the coated truffle on the baking tray, and replace in the freezer for 10 minutes for the first layer to set. Melt the rest of the white chocolate (using the same method as before), and place the desiccated coconut (200g) in a bowl. Remove the truffles from the freezer. If you don’t want to get too messy, wear surgical gloves to do this stage. With one hand, roll the truffle in the melted white chocolate. Then, drop it into the coconut and with your other hand roll it to coat it. Once the batch is complete, place back in the freezer for a minimum 10 minutes to set. I never caught on to the Disney hype – I endured a few of the films when I was younger but was never enthralled by its saccharine princesses and unrealistic princes. I rejected the dressing up stage of childhood, and have none of the nostalgia that is awakened in many when hearing or singing the songs. My only knowledge of Lion King is from Cindies (arguably the stickiest night club in Cambridge) which is played for 30 seconds without fail every Wednesday evening to excite the Disney addicts and to jolt inebriated students out of their drunken kisses. What I did love was the sugar-glazed brutality of the original Charlie and the Chocolate Factory film. I adored the Chocolate Room, and my six year old self spent a lot of time fantasising about edible wallpaper and edible TV adverts. However, the first scene, where Augustus Gloop falls into the ‘chocolate’ river, is almost too painful to watch. It was concocted using 150,000 gallons of water, real chocolate and real ice cream, yet despite its authenticity, its watery thinness is more the stuff of sewers than of dreams. 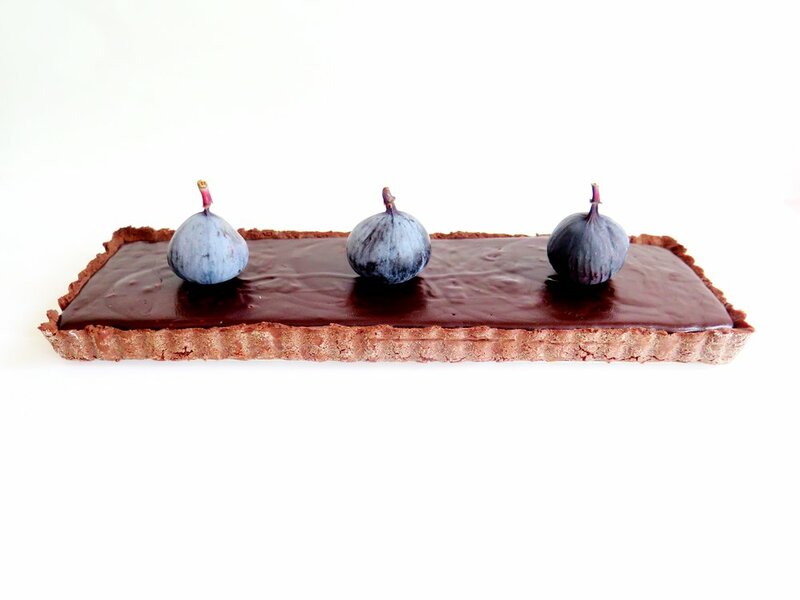 If I were going to bathe in chocolate it would need to be velvety, glossy and thick… and after 15 years of dwelling on this I’ve come to terms with the fact that this tart is probably the closest I will get to doing that. Blitz all the ingredients in a blender. Pulse until into turns into a damp sand texture. Tip out on to a surface and press it so that it clumps together into dough. Wrap the dough in baking parchment and put it in the fridge for an hour, or in the freezer for 15 minutes. Dust a surface with flour and roll the pastry out in a rectangle to a thickness of 0.5cm. Any excess can be frozen and used within 2 months. Transfer the pastry to the greased and floured tin to line it. Don’t panic if it crumbles in the transition, just patchwork it together in the tin. Place a sheet of baking parchment or tin foil over the pastry, and fill it with the baking beads to weigh it down to prevent the pastry from shrinking as it cooks. Place it in the oven to bake for 10 minutes. Remove from the oven and remove the baking parchment and baking beads. Reduce the oven temperature to 150˚C, and place the pastry back in to bake for a further 10-15 minutes until it is fully cooked. Set aside to cool. Chop the dark chocolate roughly, and set it aside in a heatproof mixing bowl. Place the caster sugar in a saucepan over medium high heat and, when it starts to melt, stir gently with a rubber spatula to avoid it burning around the edges. Push any unmelted sugar into the already caramelised sugar to aid the caramelising process. Once the sugar has turned a rich, dark gold colour, while still on the heat, pour in the cream whisking all the time. If clumps form, don’t panic: keep whisking over medium low heat, and they will eventually melt. Once the lumps have dissolved, whisk in the muscovado sugar, butter, vanilla and salt, and stir the bubbling mixture on a medium heat for another 2 minutes. Pour the mixture into the bowl of chopped dark chocolate and stir immediately until all the chocolate has melted and the caramel and chocolate are fully combined. Pour into the tart shell, smooth the surface over with a palate knife, and place this in the fridge for an hour (or freezer for half an hour) to set. 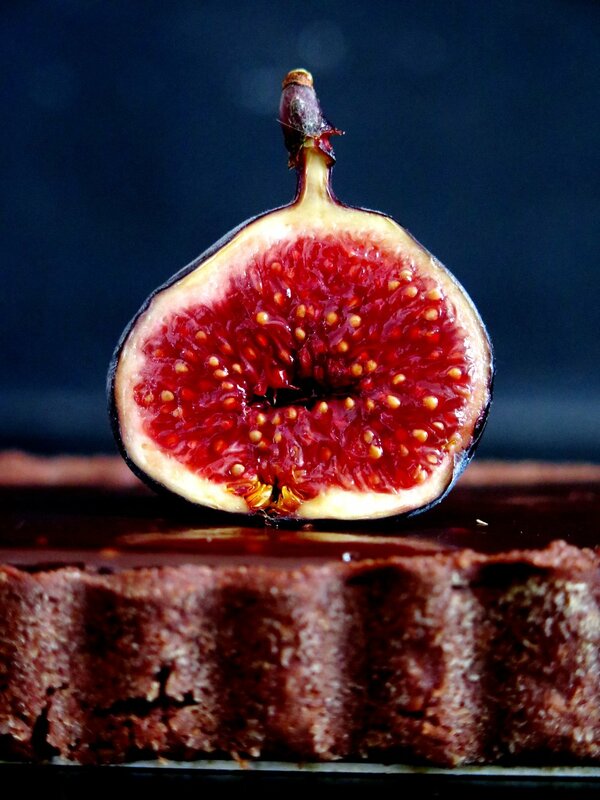 Decorate with sliced figs to serve. I’m at risk of sounding like one of those mindless click-bait buzzfeed articles when I say this, but I mean ever word: you’ve been eating white chocolate incorrectly your whole life. Would you believe me if I told you that the innocent Milky Bar Kid’s saccharine white cocoa butter chocolate has a deeper, darker, more seductive side? After about 20 minutes, the heat will begin to convert the pool of glossy molten cocoa butter into white chocolate’s luscious evil sister. I dare you to try it. It’s pretty sublime on its own but, if you can resist eating it all, it works deliciously well in a cheesecake. 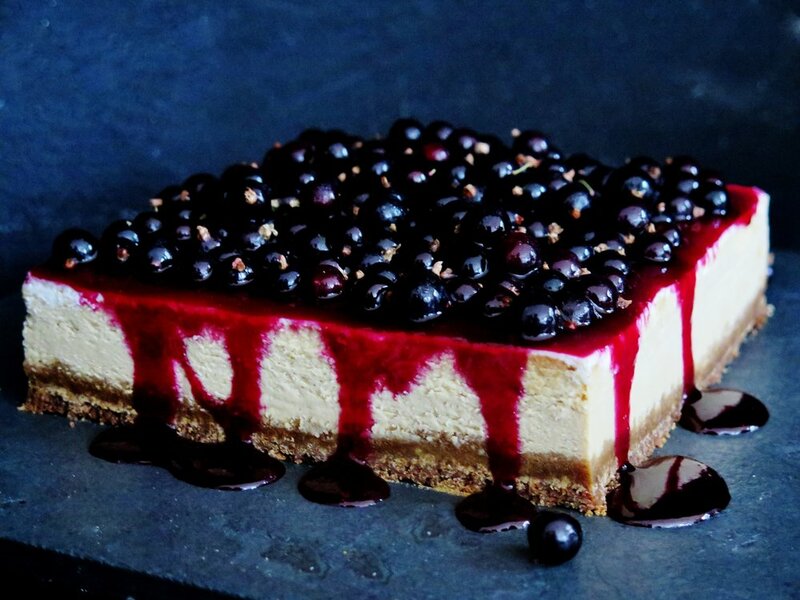 I pair it with a fudgy, salted, graham cracker-style base and an astringent blackcurrant glaze to cut through the sweetness. Often cheesecakes call for a base simply made out of crushed store-bought cookies. I’m no stranger to doing this myself, but I’m always left with a pang of guilt for cheating. Not only does homemade biscuit base taste better, it’s chemical-free and you have much more control over the flavour balance – this one’s especially fudgy. However, if you’re feeling lazy you can make the base using 400g digestive biscuits blitzed into crumbs with the 120g browned melted butter. If you are a coeliac just use gluten-free digestive biscuits. You can also use non-caramelised white-chocolate. It will still taste delicious, just not anywhere near as ambrosial. If you can’t get hold of any blackcurrants, feel free to use fresh or frozen raspberries or redcurrants instead. This is best made the day before serving and kept in the fridge overnight. In fact, the fridge works wonders. Preheat the oven to 180˚C. Pour flour, sugar, bicarb, salt and diced butter into a blender and blitz until the mixture resembles damp sand. Alternatively, use your fingers to rub the butter into the other ingredients. Whisk together the honey, vanilla and milk. Stir this into the dry mixture to combine and form a paste-like dough. Spread the dough on to the baking tray in an even 0.5cm thick layer. Bake in the oven for 15-20 minutes until golden brown and cooked through. If it doesn’t become dry and brittle after cooling, bake for a further 5 minutes. Brown the 120g of butter for melting by placing it in a pan over medium heat and allowing it to turn a golden brown before setting it aside to cool. It should give off a wonderfully nutty aroma. Crumble the baked biscuit into a blender with the browned melted butter, and pulse until it turns to damp sand-like consistency. Tip this out into the lined cake tin and press down to form an even layer. Place in freezer to set. Preheat the oven to 130˚C. Pour broken white chocolate on to the tray and place in the oven. 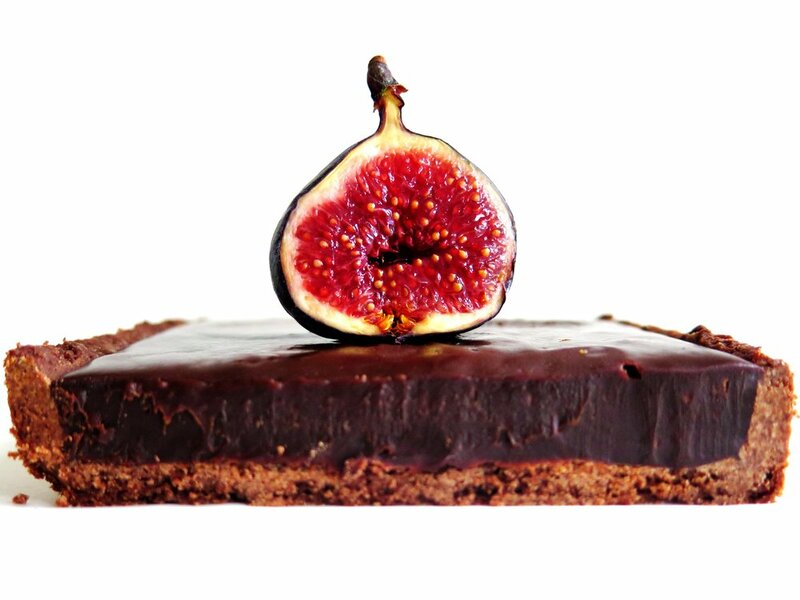 Every 10 minutes remove the chocolate from the oven, stir with a bone dry utensil, and place back in the oven. After about 30-40 minutes it will have taken on a beautiful honeyed caramel tone. As ovens vary in character and different chocolate brands vary in ingredient quality, it may take longer. The chocolate may also seize. Don’t panic if this happens: just keep going until it turns golden (I’ll explain how to proceed with this in the next step). Increase the oven temperature to 160˚C. Place the double cream in a small pan over a high heat. Once it begins to boil, remove from the heat and pour into it the caramelised white chocolate. Stir to combine until smooth. If the chocolate did seize in the oven, it will be lumpy. If this is the case, pour the lumpy cream and chocolate mixture in a blender and blitz until completely smooth. If a few recalcitrant lumps remain, simple sieve them out. Either using a stand mixer fixed with the beater or a hand held whisk, beat the cream cheese together with the caster sugar until completely soft and smooth. Beat in the cream and white chocolate caramel. In a separate bowl, whisk together the eggs and vanilla. Pour this into the cream cheese mixture and beat until completely smooth and glossy. Remove the cake tin with the biscuit base from the freezer, and pour into it the filling mixture. Bake in the oven for 1 ½ hours, checking after 45 minutes. If it begins to go brown, cover with tin foil and continue to bake for the full time. Keeping the oven on, remove the cheesecake from the oven and allow it to cool for 10 minutes. Spread the sour cream topping in an even layer over the surface of the cake. Place the cheesecake back in the oven, switch off the oven and leave its door slightly ajar while the cheesecake sets inside for a further 1 ½ hours. When the cheesecake reaches room temperature, remove from the oven, cover the cake tin with cling film, and place it in the fridge to allow it to set over night, or place it in the freezer for a couple of hours. Place 200g blackcurrants, caster sugar and water in a small pan over a high heat and stir until the sugar is dissolved. When it begins to boil, reduce heat slightly and allow it to simmer for 5-10 minutes or until it thickens to a viscosity like that of maple syrup. Strain the mixture through a sieve and place the liquid back in the pan to simmer for a further 3 minutes. Allow the syrup to cool slightly then carefully pour it over the chilled cheesecake. Scatter with fresh blackcurrants and serve. I blame salted-caramel for my short-sightedness. At the end of morning assembly, when I was five years’ old, the headmistress would read a prayer. Every one of us would dutifully lower her head and shut her eyes. I pressed mine tightly closed with my hands until, like some computer generated visualiser, semi-hallucinogenic patterns appeared. Well, mainly one pattern: a recurrent drop of molten gold slipping seductively into its glistening pool, creating ripples that seemed to extend to the corners of dark space behind my eyelids. I found the effect narcotic, and would do this without fail every morning. I now realise that the real-life equivalent to that voluptuous liquefied gold is salted caramel: fudgy, creamy slick, viscous and dangerously addictive, I’m obsessed. Too often it drenches and drowns all other culinary thoughts and ideas I have, but to resist its ambrosial pull is futile. So, instead, I have decided to partner it with its already well-established acquaintance - chocolate. That’s not to say that these cookies are in any way ordinary. Most shop bought packets of chocolate cookies are filled with empty promises, often dry, floury, over sodium bicarbonated, and rock solid. I have a friend who has developed and perfected the “cookie-pinch”. Her forefinger and thumb clamp down on unsuspecting biscuits in their paper wrapping. The motion is swift and discreet, but in that split second the pads of her well-attuned digits estimate the freshness of the cookie to the nearest hour. These chocolate biscuits, however, are crisp, rich, chewy and soft, and cushioned by their silky smooth salted caramel filling, rendering my friend’s admirable skill totally redundant. Melt chocolate and butter together in a small pan over a low heat until only just melted and smooth, stirring frequently. Set aside to cool. In an electric mixer, whisk together eggs, sugar and vanilla for about 10 minutes or until the mixture becomes smooth and slightly thicker. Gently fold in the cooled chocolate and butter mixture. Once combined, fold in the sieved flour, baking powder and salt until just combined and let stand for 10 minutes. Drop the mixture, 1 tablespoon per biscuit on to the baking trays leaving 5cm between them as the mixture will spread. Bake for 8–10 minutes or until shiny and cracked. Allow to cool on trays. Stir together sugar and water in a pan over a high heat until sugar has dissolved. Allow to bubble up for about 5-10 minutes until it turns a deep burnished gold. Don’t be afraid to let it turn quite rusty in colour – the deeper in colour you dare to go (without it burning) the more depth of flavour. As soon as it gets to the above stage pour in cream and butter and whisk immediately and continuously over the high heat until fully combined. If the sugar crystallises, don’t panic. Keep whisking over a high heat until it melts once more. Remove from heat and let it cool. You can place it in fridge, or freezer, or, if you’re greedy and impatient, you can place the pan in an ice water bath and stir until cool. I opt for the latter option. Beat together caramel, icing sugar, vanilla and salt until combined. Sandwich the cookies together using 2 tbsp of the icing (or more depending on how caramel-crazed you are). Last weekend Culina was trumpeted into existence…literally, with an evening of jazz, ever-flowing champagne, canapés, desserts & petit fours. It was a wonderful evening of abundance and great company. I had dedicated every evening of the previous week to “truffling” yet all 300 of the white chocolate coated salted caramel truffles disappeared without a trace. Salting caramel has become almost a cliché but there is definitely a reason for that combo: the salt balances the sickly sweetness of the caramel, making the truffles even more moreish. If you’re short of time, you need not dip the truffles into the white chocolate. Instead, after rolling them into spheres, roll them in cocoa powder, chill in the fridge and serve. 1. Chop the dark chocolate roughly, and set aside in heatproof mixing bowl. Or if you’re feeling aggressive, smash it against a surface (when still in its wrapper). 2. Place caster sugar in saucepan over medium high heat, and when it starts to melt stir gently with spatula to avoid burning around the edges. Push unmelted sugar into the already caramelised sugar to aid the caramelising process. 3. Once the sugar has turned a rich, dark gold colour, while still on the heat, pour in 150g of the cream whisking all the time. If clumps form, don’t panic: keep whisking over medium low heat, and they will eventually melt. 4. Once the lumps have dissolved, pour in the rest of the cream, the muscovado sugar, butter, vanilla and salt and stir the bubbling mixture on a medium heat for another 2 minutes. 5. Pour the mixture into the bowl of chopped dark chocolate and stir immediately until all the chocolate has melted and the caramel and chocolate are fully combined. 6. To chill more quickly, pour the mixture into a baking tray and place in the freezer for about an hour, or until solidified. 7. Cover a clean baking tray with tinfoil. Use a teaspoon to scoop out the mixture, and roll between palms of hands to form 2cm diameter spheres. Roll the spheres in the icing sugar to finely coat, and then place them on baking tray with space around each sphere to avoid their sticking together. Once all the mixture has been rolled into spheres, place baking tray in freezer for half an hour or until the spheres are firm and cold to touch. 8. Break white chocolate into pieces and place in bone-dry heatproof bowl (any drop of water will make the chocolate seize). Place heatproof bowl over pot of boiling water without the boiling water touching the base of the heatproof bowl. Stir occasionally. Remove pan from heat when the chocolate has melted. 9. Remove dark chocolate spheres from freezer, and one at a time, skewer with a toothpick and coat by spooning over the melted white chocolate. Remove the skewer, replace the coated truffle on the tin foil lined baking tray. Drip enough white chocolate over the truffle to disguise any blemishes the toothpick has made. 10. While the white chocolate is still liquid, sprinkle with the freeze-dried raspberry, if using. 11. Replace the tray in the freezer for half an hour until the white chocolate coating has hardened. The truffles may be kept in the fridge until you wish to serve them. Alternatively, the truffles may be kept in a sealed box in the freezer for a couple of weeks.